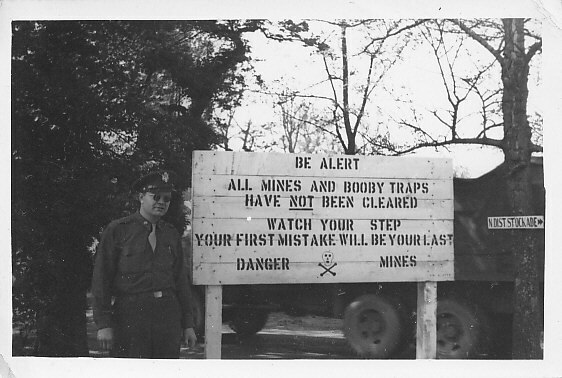 Written by 2nd Lt. 76th Hospital Train Unit, March 25, 1945. From the letter….. Although I shouldn’t call you dearest for I haven’t’ heard from you for two weeks. Even though you’re busy please take time out to write for unless we write we won’t know one another and I’m damn afraid of that. Dear I love you and want to come back to you, please always remember that. Haven’t yet seen one gal in all my travels who compares at all with you. Our chief nurse says that you’re one of the truly beautiful girls that she has seen in her life. I was very pleased and proud to hear this. Everybody knows about your mink coat and five new suits. Spend thrift that you are. But I can’t help but love you even tho I’d like to wring your neck. I visited Germany the other day. Also covered all of Luxembourg, all along the Moselle River. I saw evidence of the terrific struggle put up by the Wehrmach, German Army to you. 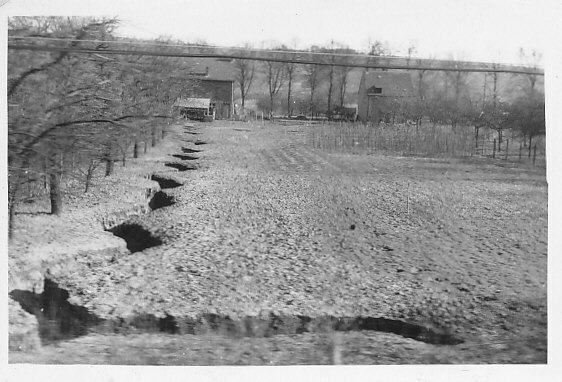 The river bank was lined for miles with fox holes, zig zag trenches and gun emplacements. The debris of battle was all around. Went over one newly built bridge (built of nothing on nothing) and all the G.I.s came out to watch to see if we’d make it. Pillboxes dominated every hill top, barb wire was all around. The sky was full from horizon to horizon with planes. The German villages nestled down in the valley, long high buildings typical Rhine country architecture. 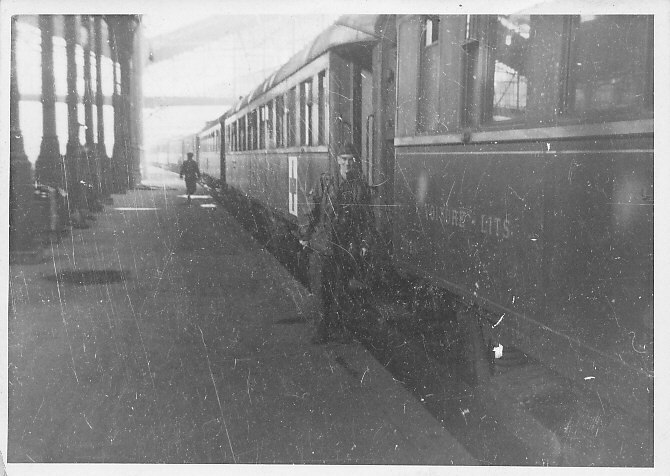 Visited Trier, Germany the first hospital train to go there. The place was a wreck, a city larger than Worcester and hardly anyone home. Thousand of houses full of furniture and everything except what the people could carry with them. Found a roll of bills. Do you know how many marks I have? 1,000,000,000, one billion. But they’re no good. If they were I could buy out Henry Ford. We wanted some wine so we took 3 five gallon jugs and a hose and went over to the local pub, went down stairs and then through a hole in the wall just large enough to admit me. I dropped into a subterranean cellar. It was so damn dark and spooky in there that all I could think about was Dracula. Took our pick of the barrels and by applying suction, each one taking turns, to the hose, we drew out the wine. How I would have loved to have you there for the adventure of the thing. Everybody has on steel helmets and guns, the tanks are rumbling by, the town is in ruins and there we are down in the cellar siphoning wine. Also got three German belts with “Gott Mit Uns” on them, a beer stein, coffee grinder, copper antique lantern, German officer hats, and lots of other things. Saw 8,000 Germans just captured. All in one field. We were at the front! The anti aircraft guns were going off and the war was being fought. Have all kinds of souvenir bullets and the next time I go up, I’ll get Clif a Luger pistol. Had to be careful of mines and booby traps. What a thrill to be right in Germany right at the front. I’m sending home this box of souvenirs, hold a belt for me and anything you want to keep and give th rest to the kids. To show you the shortage of various things over here it seems whenever I smoke a cigar some Frenchman offers me a dollar for it. I feel like a millionaire smoking cigars that are worth a dollar even though I only pay 5 cents for them. 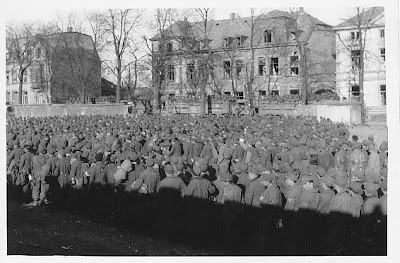 There are very strict regulations over here to prevent one from selling such rationed goods and these regulations are very necessary for the soldiers would sell everything they got if they weren’t in affect. Inflation is a terrible thing and America should be glad that the O.P.A has done so much in curbing it. I’m enclosing some pictures from Life Magazine showing bridges and taxis. I’ve ridden in the taxis and seen the bridges. Please write more often. Wednesday I’ll be 32. I can’t believe it. I’d better get home and start that family and bank account in a hurry. Some of the photos below show actual scenes mentioned in the letter above. On the back of this photo he wrote, Trier Germany. These men only captured 2-3 hours ago, 8,000. This sign warns of Mines and Booby Traps, "Watch your step, your first mistake will be your last"
This photo shows a trench zig zagging across a file next to a hedgerow, also mentioned in the letter above. On the back of the photo, it just says trench in Germany. This photo show more trenches. On the back was written Moselles river defenses, Germany. 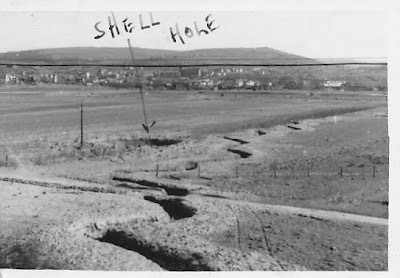 An arrow on the photo points out a hole made by an artillery shell. This photo shows the hospital train. On the back is written Texas Sgt.